Jo's Favorite Things: Autumn is Coming! 38 Days until the Equinox! Autumn is Coming! 38 Days until the Equinox! Updated for Fall 2017 HERE! 38 More Days Until Autumn! Sorry, no credit available. This came across my Facebook timeline. 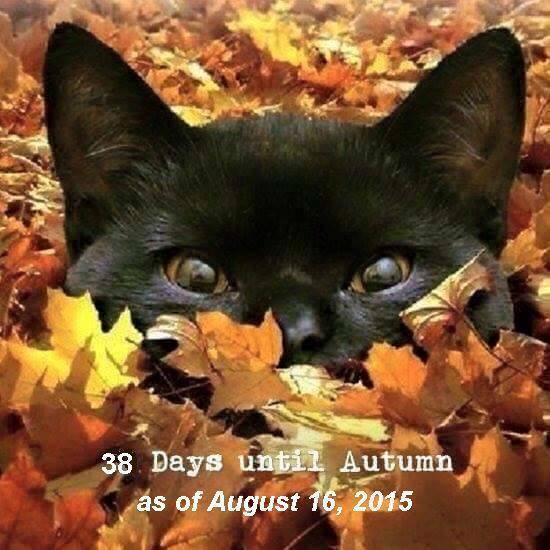 For those of us in the Northern Hemisphere, Autumn is really not that far away... 38 more days! Autumn greets us (or we greet Autumn) on September 23 at 4:20 a.m. Eastern Daylight Time, this year, 2015. That's 3:20 a.m. Central Daylight Time and 1:20 a.m. Pacific Daylight Time. On these 90+ degree days in August, Autumn, with beautiful bright days and cool nights, is a very welcome thought. So let's start counting down those days until Autumn.... and then, tonight, when the sun is a little lower in the sky and the temperature dips below 90, I'll go out and water everything. That will be enough of the outside for now... I'm sure I can find a few hours of good shows on Netflix.